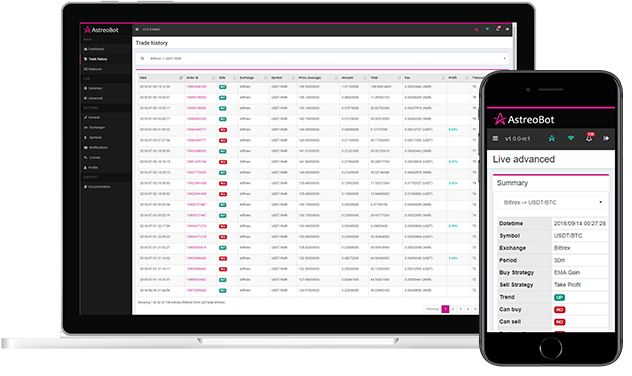 Easily configure your exchanges, currencies and strategies. Keep tabs on your trades and earnings and analize your stock’s performance. Filter data by day, currency, exchange and more! Crypto trading doesn’t have to be overwhelming. Astreobot gives you all the tools and information you need for day-to-day trading, while also keeping a section for deeper market analysis. What is AstreoBot? How does it work? In a market as volatile as cryptocurrencies, profit can’t be guaranteed since it depends not only on your strategies and settings but also on market conditions. We recommend you research the best currencies, strategies and the state of the market to maximize your profit! Choose AstreoBot, enjoy your life and make money your way.